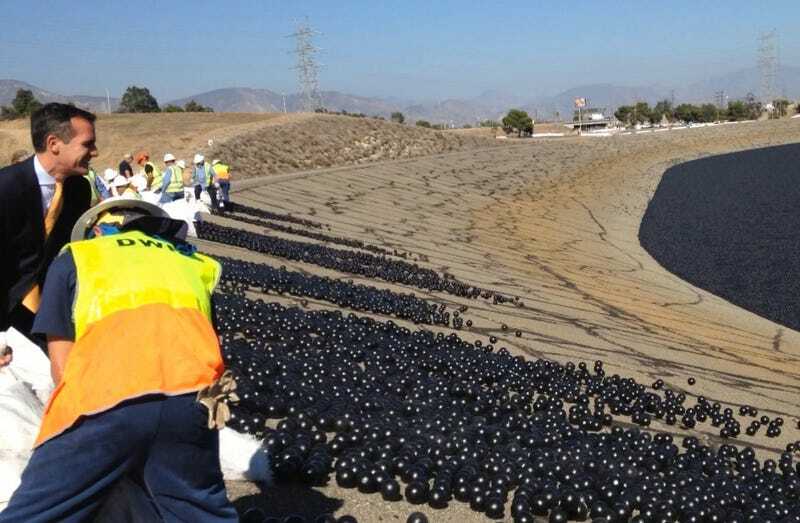 If you’re an Angeleno, you’re probably used to the black plastic balls floating in local reservoirs. But the rest of us may be wondering why LA’s turning a massive water source into a goth-looking PlayPlace. The answer? To keep the drought-stricken area’s water clean and protect it from evaporation. On Monday, LA mayor Eric Garcetti dumped 20,000 so-called “shade balls” into the Los Angeles Reservoir. It’s the final stage of that city’s water quality protection plan, an effort costing $34.5 million. A shade ball, which sounds like it could be a Pokemon move, is actually a clever water-cleaning device: Each one reduces evaporation, protects against animals and dirt, and costs a mere 36 cents. A total of 96 million have been poured into the 175-acre reservoir, which holds up to 3.3 billion gallons of water. The onyx-colored buoyant ball pit joins other inventive anti-drought measures that have popped up in recent years: One startup is helping farmers install sensors that read soil levels and tell farmers when to judiciously irrigate, for example. Meanwhile, this handheld fog catcher scoops moisture out of the air and voila: Water for your coffee. Up next, the Los Angeles Department of Water and Power is getting ready to open a $100 million ultraviolet water treatment facility that it says will keep LA water safe and help cut losses. In the meantime, we’ll see if the army of li’l plastic balls keeps the drought at bay.